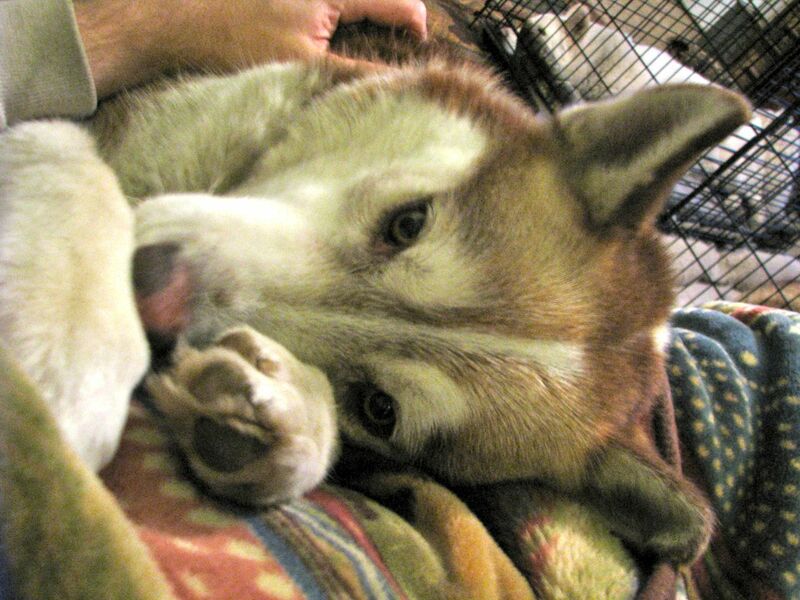 This website was started in 2006 (and moved to its current website in 2008) as a celebration of life for our Dear Nikita, the very first Siberian Husky we had ever had and a dog that will forever be a part of me. Originally written with just family and close friends in mind (who knew that there was an entire world out there that would actually read and care about our daily activities – and that wrote about their own fascinating lives? ), I wanted to keep the website focused on the celebration of life – and not on the loss. Today, despite the fact that my heart is breaking and how much I am going to miss the Big Kode Red, I want to do the same thing with our Kodiak. Knowing that Nikita’s life was coming to an end, we had adopted Kiska in August 2006 and had planned to remain at three (Natasha and Rusty were already there). 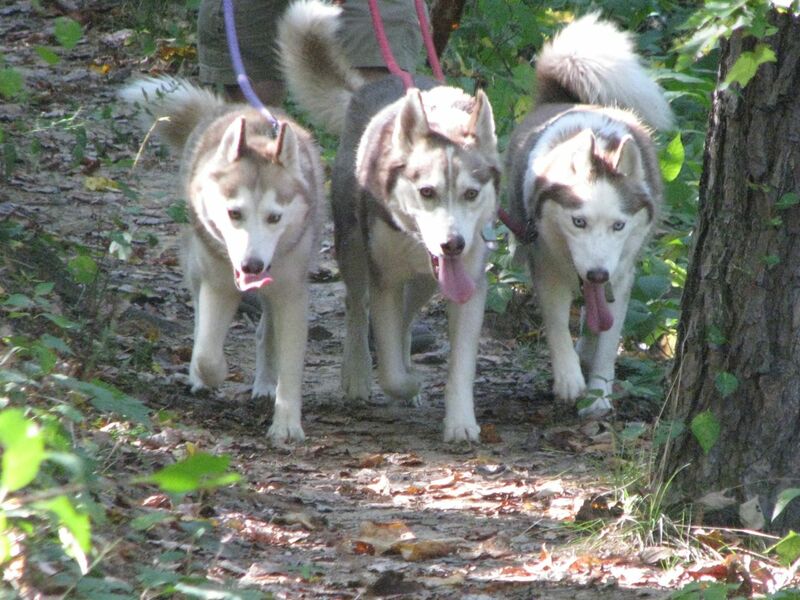 But we had also contacted Siberian Husky Assist during our search and they connected with us just over a month after Nikita’s passing with a red headed male that we needed to meet. Kodiak joined The Herd in October 2006 and our foursome was complete (two hands, two people, right? What’s the difference between three and four?). Within the first year that we had him, we discovered he was heartworm positive (both the rescue and we had performed heartworm tests that were negative. Kodiak was our medical lesson that dogs often test negative to heartworms during their first six months or so of infection). Once through that treatment, he finally began to add the needed pounds to his frame. Interesting that this summer we talked often about how healthy his coat and body was – lean, muscular and shiny coat. Why does my favorite blueberry bush have no more blueberries? Perhaps part of that health came from his love of blackberries and blueberries. We would simply be hiking through a trail and he had perfected the art of plucking ripe berries from the surrounding bushes and snacking during our hikes. Just a big old puppy. His age was always a mystery to us and we have often wondered whether he was six (assuming a year old when he first came to us) or more like ten. Regardless of his actual age, he loved being the lovable lunk. Easy going, affable, always the greeter when anyone approached us. Never the class clown nor the leader, Kodiak just liked being a part of the pack – the big brother to everyone else. He also always looked forward to our hikes. When he saw the leashes appear, he would let loose with one of soulful howls – an expression of sheer joy at the anticipation of a new adventure. After a long day of hiking, our tongues are hanging. He also loved his Jeep rides and would have spent every minute of them with his head out the window – if we let him. But when we were going slow, we indluged his passion. 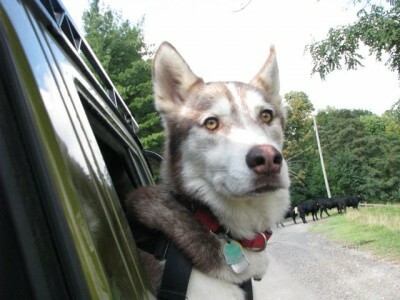 He loved everyone in the pack, but his special friend was always Kiska. They were nearly inseparable from the very beginning and we often referred to them as boyfriend and girlfriend. 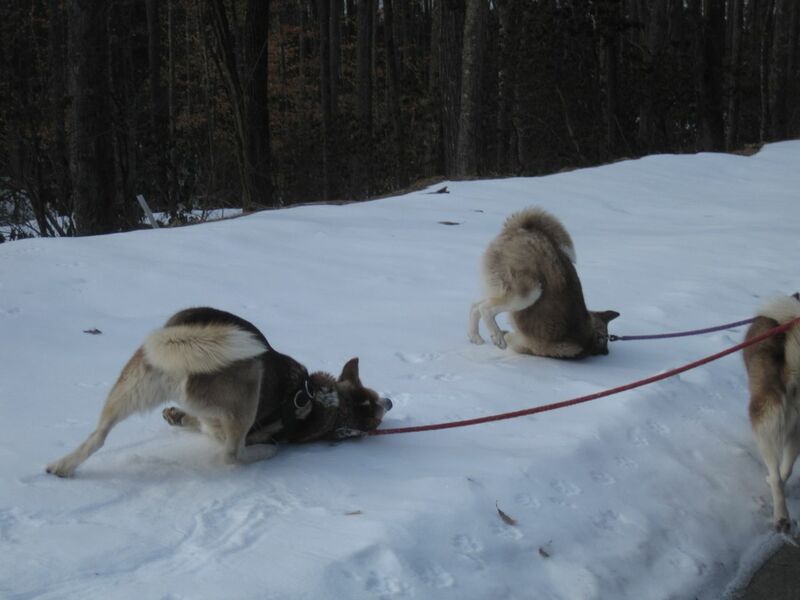 Where Kiska often lacks confidence in new settings, she hung closely to her big boyfriend for confidence. And no sleeping in the human bed for Kodiak. He certainly would come over for his good night hug and snuggle (boy, will we miss that icy cold nose), but then he was off for his favorite spot – his chair. We had debated over the summer here how nasty the chair was getting and that we were going to have to replace it, but were worried about where Kodiak would sleep. His absolute best habit – and the one I will miss the most – is the Kodi hug. During play with the rest of The Herd, he would suddenly look over at me, run over, stand on his hind legs, throw his head into my chest and wrap his front legs around me and squeeze. After a few seconds, he would run back to play. You try so hard not to put human emotions into a dog’s actions, but I could never get over the feeling that he was saying thank you for bringing him home, to agreeing to just one more member of The Herd, and to make him a part of this family. I so wish I could feel that hug one more time. We would like to link you to two special items (because we do not have the copyright permission to republish them here on our website). First, like most dog owners, we celebrate the Rainbow Bridge. 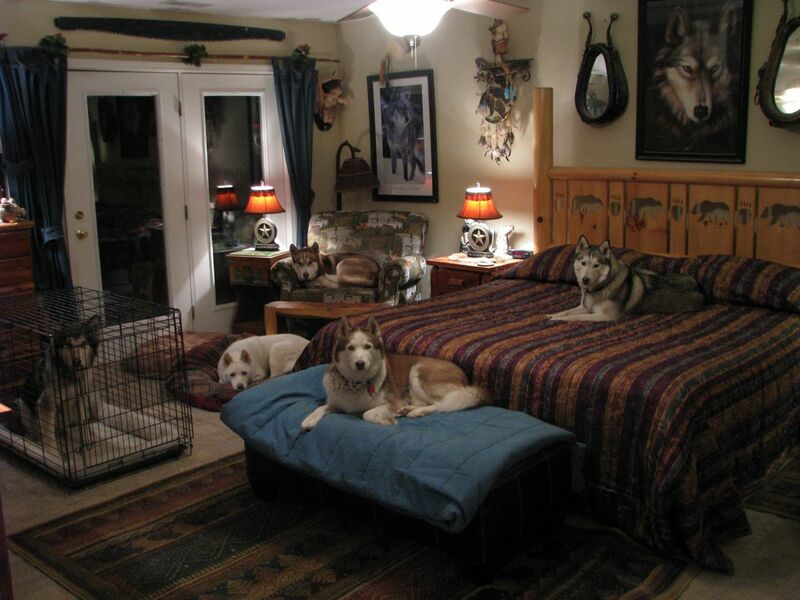 But as Siberian Husky fans, we believe in a very special part of that world – North of the Rainbow Bridge. We invite you to read this short poem of the magical place where Siberian Huskies wait to be reunited with their humans. Second, Donald Vann is a celebrated Cherokee artist and we have a reprint of this very special painting entitled Rainbow Bridge hanging near where computer work is done. This picture has been a deep comfort to us today. While we want this post to be a celebration of life, we also want to take a quick second to explain what happened. Feel free to skip this part. Unbeknownst to us, Kodiak was born with a defect that had fused his C2 and C3 vertebrae (in his neck). Fused vertebrae force additional pressure above and below the fusion and Kodiak suffered from a tragic rupture of the disc between C3 and C4 during our walk on Friday morning. The rupture was so violent that it did permanent damage to his spinal cord. Sunday morning, we finally understood what had happened but also understood the consequences. The paralysis that had affected his front legs was spreading to also affect his lungs. Even if a surgery was able to be performed, he would never have recovered from the paralysis. And the anesthesia to perform the surgery would react fatally with the nerve damage that had been done. We simply reached a point where we ran out of options. We would like to take a moment to think the doctors and staff of the hospitals we saw in the last 48 hours (listed below in the order we saw them). They were absolutely terrific in their support and care and we know that Kodiak saw some of the best people available. Our apologies for only knowing the doctors names, because there were so many professionals that treated us with such terrific care. Please pardon us as we take a few days break from blogging. We just need some personal time for healing and grieving. We just heard the news about Kodiak. We are so very sorry. We send you comforting purrs and headbutts to help ease your sadness. We have no words that could possibly comfort you, we have lots of tears for the very big hole in your heart and your lives. We are so very sorry. We will be thinking of all of you in a very special way. Kodiak has to be smiling a great big Sibe smile for your beautiful and love-filled post. We just heard the sad news about Kodiak from Khyra and had to come over to offer our purrs, prayers from us kitties and soft woofie kisses and tail wags from our Grete. A beautiful tribute for a beautiful boy. We pray for peace and comfort for your family. Beautiful tribute to a gorgeous boy. Thank you so much for sharing him with us all. Special hugs to Kiska, too. we heard about Kodiak on fb and came over here to visit your blog. we’re so sorry for your loss. you wrote such a nice story about him. we know that you have many wonderful memories and hope that you can find comfort and peace in them. We know your pain and are grieving with you. Eventually the pain will give way and the precious memories will find their places in your heart. Each loss reminds us of how very fragile all of our lives really are. Perhaps one day our paths will once again cross with the angels that we were honored to have spent a small portion of our time with. In the meantime they will wait patiently. I wish we knew what to say to ease the pain of your loss. Please know that our thoughts and prayers are with you, The Herd, and your family. You were so fortunate to have Kodiak in your life and may you be blessed with all the good memories you made together. I write this with tear-filled eyes at the sadness that must fill your hearts. I am so very sorry for your loss. This was a beautiful tribute post to Kodiak…very touching and what a wonderful and beautiful Sibe he was. I know he will be so missed. The North of the Rainbow Bridge was beautiful. I had never read that before. May Kodiak be guided along his path by the angels and be running free across the Rainbow Bridge to the North where he may forever rest in peace and watch over you and the The Herd. You are all in our thoughts. Soft woos of remembrance to Kodiak from the FiveSibes. I am so very sorry for your loss. Our hearts and prayers are with you at this time. What a lovely tribute to Kodiak! I see bits of my Kodi in your Kodiak. I’m thankful that he was with the people he loved, the dogs he loved, and doing what he loved best-going on adventures with his Mom and Dad. I’m also thankful that you had the courage to do the difficult thing, which was to think of his feelings above your own and to let him go. That’s the most loving thing any pet owner can do. My (Empress) Mimi will meet him at the Bridge to show him the ropes. God bless! Kodi and I deeply feel your loss, for not only do our boys share the same name, but they bear a striking resemblance to one another. I cannot help but grieve with you, as though I lost my own. I am so very sorry. You are in our daily prayers this week and we ask that He comfort you in the days ahead. We have come over from Huffle’s blog to offer our sincere condolences on the loss of your beautiful boy Kodiak. Your tribute is such a lovely celebration of his life but we know you must be heartbroken. So sorry to hear about your boy. You are in our prayers. We’re so deeply sorry for your loss. Thank you for giving him such a loving and full life, its our guess he’s doing full-blast zoomies across the fields North of the Rainbow Bridge right about now. He’ll never be more than a thought away from your hearts. We are so sorry for your loss. This is a wonderful tribute to dear Kodiak. God bless. My Vickie and I send all the love we can to be with you in this time of pain. WE really don’t know what more to say. I was stunned when I read the news this morning on Facebook, and now I’m sitting here, crying like he was one of my own dogs. I am so very sorry for your loss. Your tribute to him was beautiful, and it spoke volumes about the kind of dog he was and the relationship he had with you. I think it also says a great deal about how well you’ve shared him with all of us, because through your words I felt like I knew him. Kodiak lived the kind of life that all dogs should live, and I know that you were lucky to have found each other! Please know that we’re thinking of you all. Our hearts are breaking for you. We are here if you need us. The greatest gift is love, and Kodiak had that from his humans and his sibe pack. I know this is a time for grieving and reflection. But always remember those hugs of love from the big red boy…dogs know…they know who loves them and coming from a shelter, he knew what that love meant. We’ll keep you all in our prayers. What a beautiful tribute… Thank you for sharing! I had a similar thing happen to one of my beloved huskies, my little black and white, Misty Blue….it broke my heart.. and then our first Sibe, Sasha, died in her sleep…..the year previous we adopted our current furry child, Sally who is now 8… I think… it was such a joy having 3 together…. Very sorry to hear that. It really seemed like he lived a much better life with you than he would have otherwise. We haven’t had to go through this since becoming Husky people, but I know how devastating it will be. Thanks for posting this so we could all know a little more about him. We hopped over from Huffle Mawson’s when we read about your dear woofie, Kodiak. What a beautiful tribute you wrote. Our deepest sympathies and softest whisker kisses are being sent to you. Purrs. What a beautiful tribute to Kodiak, and I’m sorry that you have had to write it. From what you have described he lived a wonderful and fully loved life! Luna and Penny send their love! I will tell Echo to watch over your babies. I know how much you must be hurting. There really is no pain quite like this. Kode knows you saved him, and you gave him an amazing life. He knew he was loved so much. Please take some solace in that. As I’m sure you know from the past, time does help ease the hurt some. Our love is with you. Our hearts go out to you during this hard time. The poems are beautiful. We have tears for you and your family(dogs included, especially Kiska). It seems that so many of our beloved dogs have passed over to the rainbow bridge during these last 6 months (including our Max). We hope he was there to meet Kodiak as he came to the bridge. Thank you for the lovely tribute to Kodiak. I can picture his wonderful hugs. I am a friend of Khyra,, and I have seen your words other places too. I am so sorry that this sadness has happened. I know your heart is breaking and you wonder how you can go on. But all your friends care so much about all of you. Everyone is devistated. We are so sorry about the loss of Kodiak. Many tears are being shed because you lost a part of your family. The tribute to Kodiak is very beautiful and special. He knew he was well loved and he showed it through his hugs to you. May his paws be forever upon your hearts and he will be waiting for you with leash ready to continue your journey together forever. Hugs to you and the Herd. A special hug to Kiska also because Kodiak was her soulmate. Our candle was lit and we wish Godspeed Kodiak. So very sorry to hear about Kodiak. What a great post to remember him by. We just read about your loss on The Chronicles of Woo and wanted to offer our sincere condolences. The pain of losing them is excruciating, and is only surpassed by the joy of having loved them and been loved by them. I am sure Kodiak will join Nikita and both of them will look over the Herd. P.S. Kodiak made me laugh when he had a sip from a lady’s drink while she wasn’t looking. I will remember that forever. Hear our plaintive howl of grief at the loss of a friend and feel our paws and arms as we encircle the Herd, yes humans, too, with love and solace. We wish tears could wash away pain, and fill the void with peace. His life will be celebrated and his memory will live forever in the hearts of every creature who has known his grace and elan. Kodiak, dear friend, run free! 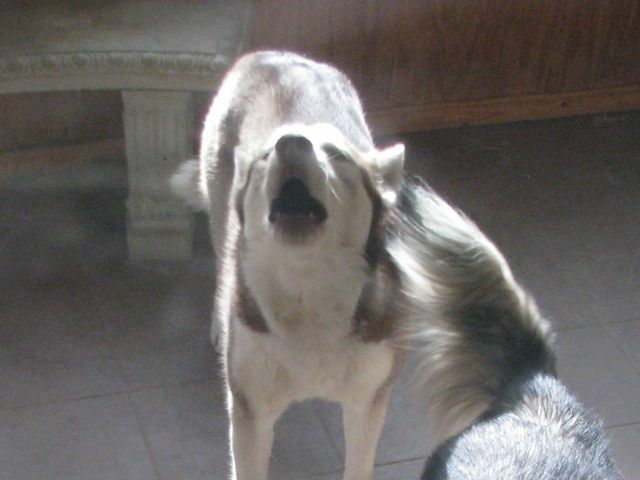 AAAAAArrrrrrrrrrrooooooooooooooooo. We are so sorry for your loss. Kodiak sounds like a wonderful dog and you gave him a chance for a great life. Sending love and hugs and roos from the gardens. Any dog could be so lucky to land a place in your hearts. Kodiak brought grace and beauty to all of us. He is forever in our hearts. I am so tearful and heartsore to hear about your dear Kodiak. You must be heartbroken too. I am so, so sorry for your loss. What a tragedy and what a shock. Your special dog will always be remembered…he has touched my heart (even though I don’t really know him). But then again, your whole herd has a really special place in my heart. Thank you for keeping us in the loop of what happened. I am so, so sad for you – and truly understand your need for a break. that you are there, in its glorious glow. Their time with us is always too short. 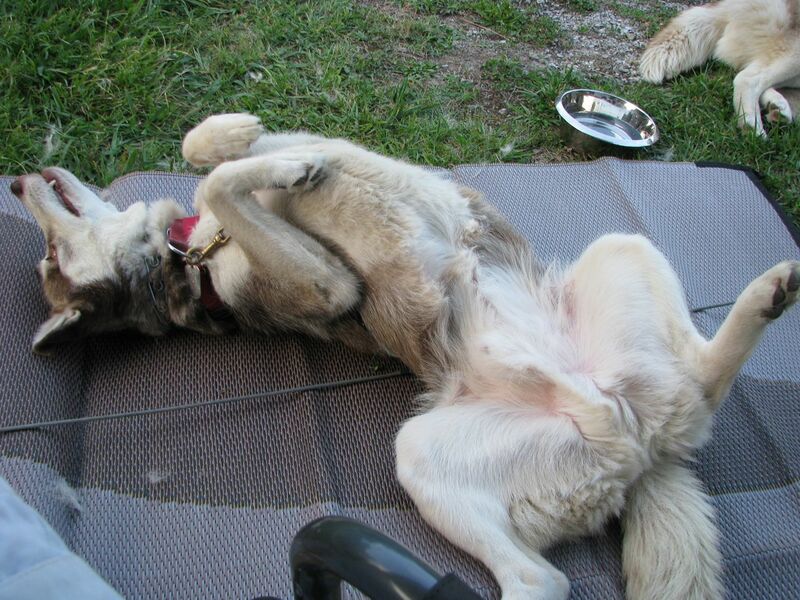 Kodiak had a wonderful life – a loving home, a pack of his own, the extended pack at the Annex and great adventures. You did everything you could including the final act of love. We’ve lit a candle in his honor and whenever we see a single tree in the middle of a field, we’ll of Kodiak. Please hug each of the Herd for us (plus an extra for Kiska). With so many tears in my eyes, that I can hardly type this, I just want to say how truly, deeply sorry I am for your loss. The wonderful memories you all have, and have so graciously shared with this blogging community mean so much. We feel as if we have lost a member of our family too. Kodi knew how very much he was loved, and will be so happy to be reunited with you one day. Until then, he will wear his precious silver harness with great pride and watch over you all. I am so, so sorry. Like others I too heard the news via a mutual friend on Facebook when I woke up this morning. I admire your courage for writing such an amazing tribute before taking the break you so badly need to be together and start to heal a little. Everyone here in our house sends you all our love. Having lived with a red Siberian for two and a half years now, and having gotten to know his distinct personality, it’s made me keenly aware of how special these guys are. For better, for worse and for everything in between, there is absolutely nothing like a Siberian Husky. I look at the photos you posted of Kodiak, and I can see all the ways he was different than Rex, and all the ways he was the same. Brothers in red they were, even though they had never met, and we feel your loss as strongly as we would if we were in your house. Rex just now came over to me, sat down beside me with his ears back and began licking my hand. It’s no secret that our Sibes know when something is wrong, and Rex is paying his respects. We grieve for your loss, the pain of which is unfathomable to anybody who has never been fortunate enough to share their lives with a Sibe. You gave him a wonderful life, and he in turn enriched yours. That’s what it’s all about, and I hope that when the pain has lessened, that is what remains with you. God bless you and rest in peace, Kodiak. DK and Herd, I’m heartbroken and so sad. I’ve never been on the receiving end of a Kodi hug, but I can’t imagine life without it. The four of us send you are deepest woo’s for the Herd’s loss. Run free Kodi, and hang that head out the window in the jeep up there! We are also one of the many who started out as followers of your website but have become your friends through posts and comments and shared adventures. Kodiak was really a special pup and if we feel the loss we can just imagine how this affects you and the Herd. He was and will always be part of the Herd for us. We may only just send you our hugs and prayers and for sure it will not give enough comfort but we can assure you the Kodiak will forever live our hearts and we thank you for sharing him with us through your words, images and beautiful posts. 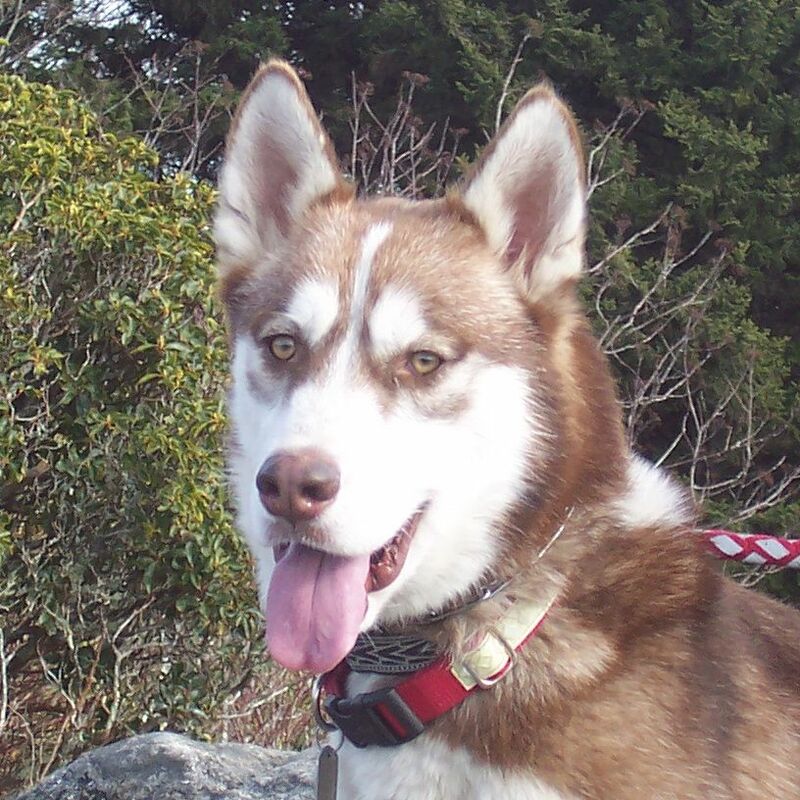 Lots of love and hugs and everything to you and yours – may Kodiak frolic forever amid the Rainbow Bridge. Wooo what a fantastic tribute to beautiful Kodiak. There have been many tears shed in our house for your loss. Nothing we can say or do can make it any easier for you, but we send our biggest hugs to you all. We are so very sorry that you had to say goodbye to your sweet friend. My heart goes out to the whole herd during this time of sadness. Have enjoyed reading your blog & hearing about all the adventures. The tribute to Kodiak is a tribute to the love you all shared. You will always have that. Kodi hug! Even when they are gone from us in one aspect they are always with us. Believe their spirit is always with us until we meet again. Thank you for sharing your herd with all of us. We lit a candle for Kodiak, as many did so the trail was mighty bright for him. Licks of love to all of you. My heart is overflowing with tears for your loss. I wish you strength for the days to come, and may you find comfort in the presence of the rest of the herd. This is such a beautiful and loving tribute to Kodiak. What a very special boy. Know that we are thinking of you and sending hugs from Ohio. Please know you are all in my thoughts and prayers during this most difficult time…A hug of support to you both! Kodiak, Run free to the north of the bridge. Woo are all in our hearts and prayers. What a beautiful tribute to Kodiak. You all gave him such a wonderful life! You are all in our thoughts. Kodiak knew how much he was loved and will be sorely missed. You gave him the best years of his life and, going forward, the sweet memories of his life with you will sustain you. I am just heartbroken for you and your herd. It’s been a difficult weekend for me too & I am in tears. What a wonderful tribute and he sounds like a special dog and that he had many wonderful years full of love with your family. wonderful tribute to your puppy’s life. so sorry to hear things didn’t turn out well. We are so sorry for your loss. It’s hard enough to accept the loss of a beloved pet and family member when it’s an expected loss. But when it happens suddenly, it’s almost too much to bear. Kodiak will live on in the hearts of all who loved him. As always, wonderful writing about The Herd and the very special Kodi. Kodiak sounds like a truly magnificent pup. What a blessing it was that you were brought together, and you were able to give him such a wonderful life. So sorry about Kodiak. He had a wonderful life with you and his Herd pals. He sounds like he was a terrific dog. A fantastic tribute to the Big Kode Red. We’ll light a candle for him tonight, and eat a few blueberries in his memory. We are so sorry for your loss, and we grieve with you. I am so grateful that Kodiak was adopted into a family that gave him such a beautiful and fulfilling life. I’m so sorry. I know Kodiak loved his life with you, and thank you for sharing him with us. He was a very special boy! We are so sorry to hear about Kodiak. He had a wonderful life with you and the rest of the herd and we are so glad you shared his adventures with us. Oh Herd… We are so, so sorry for this sudden loss of your pack mate. Amber expressed our thoughts above. While we are shocked and saddened by Gizmo’s recent cancer diagnosis, we have had time with him to love him and grieve with him. You had the shock of the situation and the sudden loss of beautiful Kodiak all at once. Please love each other and hold each other close in the coming days and months. I am so sorry for your loss. You gave Kodiak a wonderful life and he loved you back dearly for it. Prayers for the hu-family members and also for the pack. What a beautiful tribute for a very special member of your pack. What a great celebration of Kodiak’s remarkable life. 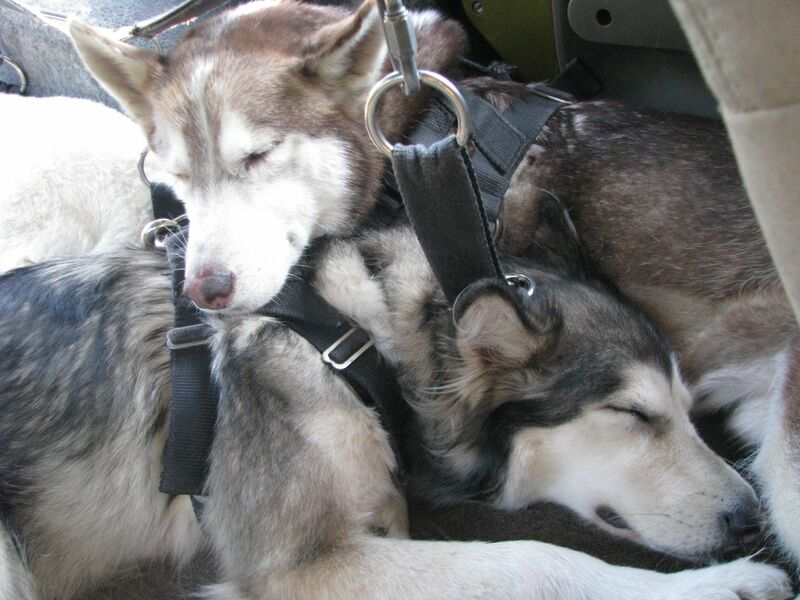 While we mourn for your loss, we know that Nikita has welcomed Kodiak into the next life and they are having remarkable adventures together, frolicking and running and enjoying all pups who have left this world. One day, we will all be together again. May time, memories and love help ease your pain. We just heard about Kodiak, and came to give you some big (((hugs))). So sorry for the sudden loss of such a loved one. Mom had an Akita named Kodiak before me and this post brought back many memories. May Kodiak run free at the bridge with his legs working just fine. We are thinking of Kodiak today and celebrating him and the life you gave him. No one could have done it better. I am in tears about Kodiak! I am so sorry for your loss! I am crying as I type this. I am so, so sorry. I hope that time and prayers will heal. Don’t rush to grieve. Each is special and different. I lost my westie 3 years ago. I found one of her tee shirts the other day and totally lost it. Denesa was my sweetie and one more hard headed little girl! God Bless You for your hard decision. it was the right ting to put HIM first. We are so sorry for your loss. Mom oftens says she doesn’t know what is better – having time to accept it but seeing a pet fade or having it be sudden. There is just no good answer. Please know we are sending you purrs and that Kodiak was so very lucky to have you as his family. With tears in our eyes, we will raise a glass and light a candle for Kodiak and wish him Godspeed to his new home where he will be free from pain. A beautiful tribute for a handsome boy, and we thank you for all the ways you’ve shared your The Kodiak with us over these years. Please know how much we will always love him. I feel your broken heart over the course of the miles, but so respect and admire your love and honor for Kodi, even in the shadow of this world’s loss. So heartbreaking to lose such a magnificent dog, but the memories will last forever. We came from Jan’s Funny Farm to say how deeply sorry we are. Our human lost her beloved angel Chumley (cat) suddenly one night, January 24, 2007, to a blood clot. No prior warning or health issues evident. The shock was beyond words, so she understands. There is nothing to write that will offer comfort, but please know we’re sending you purrs and universal Light, wishing you peace and blessings. We came from Jan’s Funny Farm to offer our deep sympathy on the loss of Kodiak. We can see from your posting how special he was to your family. We will keep you in our purrs. It’s hard to find the words that can make things better during times like this, but words can’t do it. It’s the love you hold in your heart and memories that can never be taken away that helps you heal. So sorry for your loss and thank you for sharing with us. I, too, have a beautiful big red boy and believe there is something special in these big red guys. There is no doubt he is wearing that Silver Harness with much pride North of the Rainbow Bridge waiting patiently for your arrival with friends and family that have gone before. He was absolutely blessed, and so were you, to have found each other for your earthly time. So very sorry for your loss. Many hugs and prayers sent your way. Our hearts go out to you all during this difficult time. What a beautiful tribute to your furr baby Kodiak. We cannot imagine your heartache. Please know that we are sending lots of love and hugs across the miles. Betty and I send our deepest sympathy. I’ve told her all about her Husky sister, Dakota, and read the Herd’s blog to her. I know, but I always read to my dogs, and somehow I knew Betty would love your adventures. Kodiak, may you run free, find snow, and send a snowflake to your family to let them know you are OK.
My thoughts are with you on this sad day… Kodiak was lucky to have you, and you were lucky to have each other. Sending hugs your way. You and your pack are in our thoughts and prayers. It is so difficult to loose a member of the pack. In many ways death is part of the celebration of life. Completing a strange circle. We can relate to the sudden loss because of the passing of Deacon this May. Life goes on though. In our case Sherman has joined our pack. He has helped Dog Dad to heal. God bless, you, your pack and your friends. We are so sorry to hear of the sudden and tragic passing of Kodiak. I had a similar experience years ago so I truly understand your pain. Kodiak was blessed to have you as his “pawrents” and he will be with you always, watching over you and the Herd. I truly love the “North of the Rainbow Bridge”. I had lost my link to that and I am sure our huskies will be waiting there for us. Please accept our sincere sympathy and condolences on your loss–our thoughts and prayers are with you and the entire Herd. We are so sorry to hear of the sudden and tragic passing of Kodiak. His spirit will be with you and the Herd, watching over you. Kodiak, wear your Silver Harness with pride and I am sure we will all see it flashing in the night sky. Our thoughts and prayers are with you and the Herd. Your post was a beautiful celebration of his life. He was blessed to have you as his “pawrents”. We’re so very sorry to hear about Kodiak’s sudden passing. Please know that you are in our thought. I am so sorry for your loss. I wish there was more I could say. My thoughts are with you! The blogging world of dogs, as you know, is mourning Kodiak’s passing with you. It’s never, ever easy to have someone we love leave us when their Circle of Life is complete. We always wish for one more day – one more hour. You gave to Kodiak more than most dogs ever hope to receive – he knew that. My heart breaks with yours. I’ve lost a dog to a sudden onset of illness and it is one of the most painful experiences I’ve had in all my years of loving animals. Rest with the angels, Kodiak. It’s never good-bye, it’s always see you later. I read your posts on FB about Kodiak while I was on vacation and didn’t have much time to comment. My heart aches for you and your family, losing a dog is never easy, however losing one so suddenly and without warning makes it even harder. I’ve always known the bond the doggie blogging community has, but it is never witnessed as strongly as when we ALL lose a member of the pack. While our sorrow is not nearly as great as yours, know that we truly do come to love these dogs (and cats, etc) that are blogging on a regular basis. You can see that by the number of comments that have already been left. RIP Kodiak. You will always be missed, and never be forgotten. So sorry to here of your loss of such a great boy. Our thoughts and prayers will be with you and The Herd. I have no doubt Kodiak is still giving you that hug of thanks for being the best hu-dad for him. We will also send a special paw prayer out for Kiska. Hope she is doing OK. Thanks for celebrating Kodiak’s life with us. I am so sorry about the loss of Kodiak, a well-loved member of your herd. He lived a good life with you and the herd. I guess at the end of the day, that’s what matters. No one is ever forgotten. Kodak will always be with you. I bet one day you will even feel his hug again – just when you least expect it. Love and hugs to everyone and extra ones for Kiska. There are tears flowing freely here. We are so sorry for your loss. Such a sad passing, but such a beautiful tribute. What else can we do, but remember the joy we shared with them and trust that they are spreading that joy in the realm they occupy now. I’m so very sorry to hear about Kodiak, thinking of you all at this time. I’m sorry we’re so late with this, did see it on FB but not got around to dogblogging until today. What an absolutely heart-rending experience for you on the beach with Kodiak. And what a lovely dog. So sorry. We’ve not visited your blog before, don’t know why, but will add it to our blogroll. You have some gorgeous photos of the TH. I am so sorry for your loss. 🙁 You were lucky to have each other, and nothing can take those precious memories from you. My heart goes out to you and your pack. We are so sorry to hear of your loss. You and yours are in our thoughts. We’re very sorry to hear Kodiak has crossed the bridge. We feel your loss and hope the Herd can recover soon. Thank you for sharing your life with us, Kodiak. You know you are very special when the Herd invited you to join their pack. You have lived a fulfilling life….now you can finally run free in your silver harness. We are so sorry to learn about Kodiak. It looks like all of your lives were enriched by having found each other and he left lots of wonderful memories to comfort you. Take care . . .
Our hearts go out to you in this time of loss. God Bless. Oh. I am so so sorry for your loss. I just saw the post earlier today about what happened and I had high hopes he was going to pull through. Our hearts are broken for you and the rest of the heard and we send all our thoughts to you. Big hugs and giant Dane kisses to all of you from Seattle, especially Kiska. I thought you had lots of comments the other day when you reported on Kodiak. Then with a few quiet moments I tried to catch up on blog reading when I read the sad news on Bailey’s blog. Despite the number of comments this time, I want y’all to know you are in our thoughts. I am so sad for y’all. My paws are crossed for y’all. My Human said she will add your humans to her prayers. You gave each other the great gift of friendship and love. In the blink of and eye, and a roll in the snow, you’ll be together again. We are so so sorry to hear about Kodiak. Our thoughts are with you. Our lives are always enriched by our furry family fellows. We shall celebrate their lives with us. we are so very sorry to hear the tragic news about Kodiak. Our thoughts are with you. He was a beautiful boy. Run free with the wind in your face Kodiak. I am so sorry to read about Kodiak. I am so sorry about Kodiak. Our thoughts are with you. I am so sorry for the loss of your dear Kodiak. He will be remembered fondly by all. My heart is with you and your beautiful pack. What a beautiful tribute to a wonderful member of the herd. You gave him such a wonderful life. We are so sorry for your sudden and tragic loss. I enjoy following the adventures of the herd and can imagine how hard this is for you all. Please take care. You are in our thoughts. I’m sure Kodiak and Marmalade are hanging out and howling together somewhere across the bridge. I’m terribly sorry. Try to remember that you gave Kodiak a very good life after he came to you. 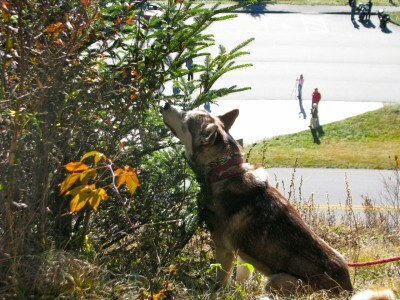 I hope all of you (humans and Sibes) are doing OK.
We are so sad to hear of Kodiak’s passing. We know you are heartbroken. Godspeed, Kodiak – we’ll see you at the bridge. How heartbreaking. It is never easy to say goodbye. I am so very sorry to hear about the loss of your beautiful Kodiak. Our thoughts and hearts are with you. Just stopping back over to check in and see how you all are and how Kiska is doing; she must miss her b/f. Thinking of you all, and hu-dad too. May memories and time bring you all comfort and peace. I am so sorry to hear about Kodiak. We all enjoyed him through your blog and share your sorrow. I know I’m late, but I’m so very sorry for your loss. I wish I had some magical words to say, but there just aren’t any. SO SORRY FOR YOUR LOSS. HE WAS A BEAUTIFUL SOUL. I KNOW HE WILL BE MISSED DEARLY. I KNOW THAT HE WILL BE WAITING AT THE GATES OF THE RAINBOW BRIDGE FOR YOU. RIP PUPPY YOU ARE MISSED. Ohh my I am so very sorry for your loss, it must have been such a shock for you all. Please know you are in my thoughts and prayers and we will all be thinking of you here across the water. All of us here are so sad for your loss. This is a lovely tribute. All hail Kodiak. So sorry to hear the news of Kodiak’s passing. Run free dear Kodiak. I have many pack members that have crossed the Rainbow Bridge throughout the years so be on the lookout for them. RIP and Godspeed! I am so profoundly sorry for your loss. As a fairly recent Husky owner (will be 2 years in December), I have so enjoyed your blog and getting to know all the characters in your herd. Thank you for sharing their lives with us. I will give my husky girl Kaya an extra hug for Kodiak tonight. My deepest condolences. Over the years, I’ve loved reading about the herd and their adventures. I cannot even begin to imagine the hole in your hearts. Thoughts for healing in a time of such loss. Thank you for sharing him with us through your words and photos. I am so very sorry for your loss. I just recently became aware of your blog due to Penny Blankenship putting a note about Kodiak. How wonderful though that he did have a life with you, I’ve owned this breed for over 30 years and have known very few people who give them the type of life he was given. God bless you and may He comfort you in your loss. I’m sorry I’m a bit behind in my reading and just saw this now, though we’ve been thinking of you all and hope you’re finding comfort in your wonderful memories of Kodiak. After reading this I’m wondering, how’s Kiska doing? I am so sorry and sad to hear about Kodiak…..You are all in my thoughts. This is my first time reading your blog and I cried. I’m very sorry for your loss. I’m sure Kodiak is having a great time with my Kaiser north of the Rainbow Bridge. I just came back from my holiday… went through some blogs and learnt that Kodiak has crossed the bridge. I am deeply sorry for your loss. You are all in my thoughts. I’m so sorry for your loss. 🙁 I can’t believe how quickly he was gone. I can’t even imagine how you must be feeling. At least you know you saved him and gave him an amazing life with you guys. Your herd is so loved. Give the rest of the herd a big hug for me please. Sorry we missed this, we got busy for a while and it slipped by us that you had lost Kodiak. He had a wonderful life with the Herd and we’re sure he’s having a good romp north of the Bridge with Nikita and the other snow dogs who went before him. Awww.. Kodiak is in good paws. He will have lots of fun with my older furbros. He definitely knows that he had the best possible life here and he showed his appreciation. We send our good thoughts to you to get you through this. I was heartbroken to realize that you lost your sweet, beautiful, funny Kodiak in October. We have lost 4 of our best friends (2 horses and 2 doggies) in the past 3 months and I have been extra hermity so I missed these posts about your horrible loss. I am so terribly sorry. We all send our sincerest condolences and lots of love. Please give Frankie a huge welcoming hug and tail wag and a special hug for kiska-I was so sad thinking how confused she must have been. I am happy to see that she likes adorable Frankie.